March Madness is at its peak in the first weekend of the NCAA Tournament. The shocking upsets, the buzzer beaters, the Davids vs. the Goliaths, the constant basketball from 11 in the morning until midnight, all of that usually makes the opening weekend (rounds 2 and 3 now) the most exciting and favorite weekend of the three. But in reality it is the tournament’s second weekend that should be the most compelling. With the Sweet 16 kicking off today (Thursday the 22nd) the tournament really hits its stride. You still get a lot of basketball (to the tune of 4 games a day Thursday and Friday) but something has changed. The stakes are that much higher. For the upper echelon teams, the one and (usually) two seeds, the opening rounds have the same theme: to survive. However when the Sweet 16 begins everything is amplified. The teams coming in with lofty expectations begin to realize that they are so close to their ultimate goal of the Final Four but are still incredibly far away. They know that anything but a Final Four birth would be considered a failure, even moreso than a loss in the 2nd or 3rd round. A loss in the 2nd or 3rd round can easily be written off as a fluke, maybe they had played a team they didn’t match up well with or the upset happened because the players weren’t focused. Sure the loss is still disappointing but not nearly as much if the team survives to the Sweet 16. Now the fans and players have talked themselves into the possibility of making the Final Four and the fact that their favored team didn’t get beaten by some upset minded, senior-laden team in the first weekend shows that they belong in the Sweet 16. Making the losses all the more excruciating. Let’s not forget those same upset minded teams that played their way into the Sweet 16. They are still seeking validation. Sure, they made it to the second weekend in the tournament but they are still under-appreciated. They know that if they don’t at least win their Sweet 16 game their upset will be seen as an instance that a team just got hot for three days, while a win would validate their quality. Let’s not forget about those seniors either. Their mindset completely shifts from the first weekend to the second weekend. In the first weekend they are just glad they get to continue their careers before, most likely, not being able to play basketball on such grand stage again. They are excited and giddy and while they don’t want to lose in the first weekend they realize that anything can happen. Their survival to the second weekend though is different. Now the fear of losing is even larger. They have had an entire week to convince themselves they have a legitimate shot at going out a champion, that their careers can last a whole four games more. Instead of being happy about getting to play more basketball they now become tense because they don’t want to be lost in the middle ground, they don’t want to their careers to end in the Sweet 16 or Elite 8, knowing just how close they are to making it to a Final Four. Likewise the Final Four doesn’t hold the same mentality. If a team reaches the Final Four a sense of accomplishment is felt. Knowing that you made it to the final weekend as one of the top four teams in the tournament is something you can take pride in. Sure everyone wants to win the championship and the fact that two teams have made it that far and lose just before the championship game is heartbreaking but in the end they’ll be able to rationalize the loss away and say, “Yeah we lost in the Final Four but we also got there. We had a hell of a run in the tourney and while it stings to not be able to play for the championship I can still be proud of how far we came.” The Sweet 16 and/or Elite 8 doesn’t have that same rationality to it. Smaller school teams will probably feel prouder of a Sweet 16 birth than a powerhouse school but there are a slew of Sweet 16 teams that get lost in the annals of history. No one cuts the nets down at the end of the first weekend. So enjoy this weekend. 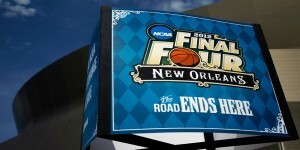 Enjoy the most compelling time of the tournament, where the wins are celebrated and the losses are devastating.